Dead End 1953 Chevrolet with AccuAir Suspension! Sweet! 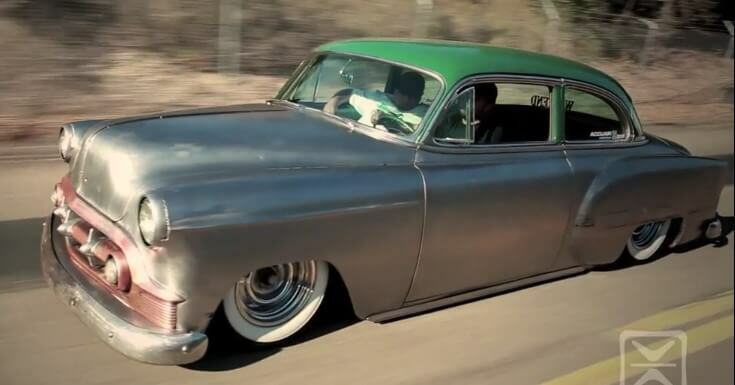 Dead End 1953 Chevrolet Bel Air with AccuAir Suspension! Sweet! Dead End 1953 Chevrolet Bel Air, custom two door that belongs to Eddie Padilla from Campos Custom Fab. The car has become a project car for the crew at Dead End Magazine. The car’s story starts when Campos finally managed to pick up the car from a family member who had the car sitting out in the elements wasting away, after a whole lot of asking. They were gonna go with stock look, but then decided it was boring and that’s how the Dead End 1953 Chevrolet was built! The result is exactly what Padilla and his friends were aiming for, and definitely not normal or stock-looking by any stretch of the term. The Dead End 1953 Chevrolet’s uber-slammed stance is thanks to Accuair’s innovative E-Level air management system that can adjust the ride height of the airbags with the touch of a button. The insanity continues under the hood, where an unexpected powerplant resides – a carbureted LS engine!! Padilla says he’s not done with the Dead End 1953 Chevrolet yet! We are so excited to see what’s gonna happen next with this Dead End 1953 Chevrolet Bel Air, and who wouldn’t be? Look at it, the car is turning heads wherever it goes! Check Dead End 1953 Chevrolet video below! 2 Ducati engines powering one single motorbike – for the win! Volvo trucks and Magnus Samuelsson against 750 tons!! Wakeboarding with dolphins, the experience of a lifetime!!! Drunk Guys and A Motorcycle – The Worst Combination Ever!